Neerja is an out and out Sonam Kapoor film. And then it is Shabana Azmi’s and Yogendra Tiku’s—in that order. This Ram Madhvani biopic on Neerja Bhanot, the heroic head purser of Pan Am Flight 73 that was hijacked in 1986, charts the life of the simple, but independent and hardworking protagonist (played by Kapoor). Raised by supportive parents, Rama and Harish Bhanot (Azmi and Tiku), Neerja is subjected to physical abuse by her husband. Yet, the 23-year-old goes on to save the lives of more than 350 passengers, and the three pilots, when Palestinian terrorists take control of the Delhi-Frankfurt flight at Pakistan’s Karachi airport. Neerja is martyred in the process. The film opened to raving reviews on Friday (Feb. 19), with box-office collections steadily rising. A rarity for long, Bollywood has over the past few years given women protagonists a big break. And it seems to be working well for the industry. Around this time last year, Bollywood wasn’t in a mood to party. Some male-led, big-banner productions such as Roy, Shamitabh, Tevar, and Hawaizaada had bored viewers on their way out of theatres. The silver lining was Akshay Kumar’s action spy thriller film, Baby, that just fell roughly Rs5 crore short of the coveted Rs100 crore benchmark. Then a series of women-led movies, beginning with Bhumi Pednekar’s Dum Laga Ke Haisha in February, Anushka Sharma’s NH10 in March, and Deepika Padukone-starrer Piku in May brought in the money. The icing on the cake was Kangana Ranaut’s Tanu Weds Manu Returns, which in June became the first movie of the year to hit the Rs100-crore mark. Incidentally, it was also the first ever woman-led movie to reach the milestone in Indian cinema. By end-2015, this sequel to the 2011 romantic comedy was the year’s fourth highest grosser. 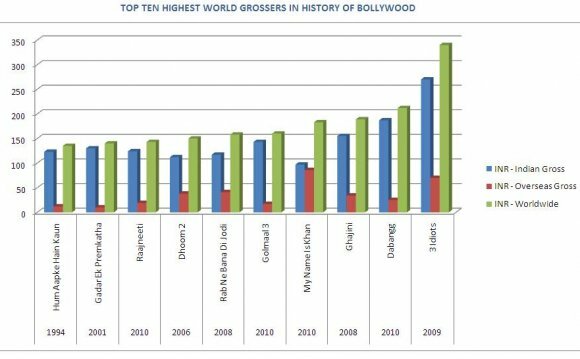 In 2016, the wait for Bollywood’s first Rs100-crore film was cut short in January by Kumar’s Airlift (Rs124 crore)—set in the backdrop of the evacuation of Indians in Kuwait during Gulf War-I. With Neerja, though, the women’s brigade seems to be painting tinsel town red—again. Most other films of 2016, including Aditya Roy Kapur’s Fitoor, have failed miserably till now.